The second installment in our Art/Music/Film nightwent down on the 14th November 2014. We are very stoked to have Scarborough’s Chris Brehem showing his most recent work in an exhibition of his surreal paintings. 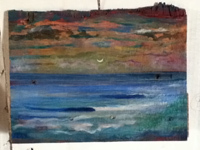 He’s a great surfer/artist/human and his work is unique and quite affordable, so if you ever wanted to get some awesome, original surf art for your home then bring a few extra bob along and support the man. One-off pieces go from as low as R200. 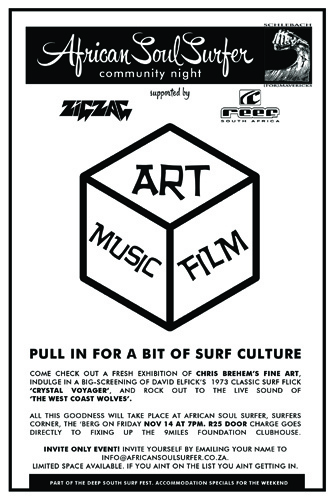 In the cinema we’ll continue to be showing our cult surf movies to educate the youth and tickle the ballies nostalgia. The classic flick this time will be Dave Elfick’s 1973 seminal work ‘Crystal Voyager’ which includes some ground-breaking footage of George Greenough POV tube-riding decades before GoPro made it something everyone could do. Insane Pink Floyd soundtrack too! 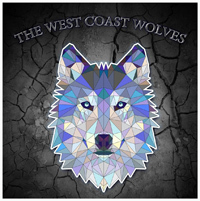 In the cafe we have a live performance by ‘The West Coast Wolves’, a local ska/punk/reggae outfit comprised of a motley crew of local surfers, and sure to be entertaining! 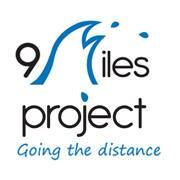 All proceeds for the night are going to help the 9Miles Foundation in fixing up their clubhouse at Strandfontein Pavilion. For those who dont know them, they are a 100% local run NGO that is giving kids from a VERY tough background major stoke through surfing, with a strong emphasis on education and positive role-models. The kids will be having a surf, braai and surf movie (Modern Collective) in the arvo of the event and will be there till 8pm, peeps are welcome to come early and hangout with these stoked out little groms, they are awesome! 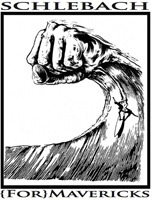 Another aspect to the night is getting involved in helping local big-wave nutter and all-round good guy Mike Schlebach reach his dream and surf the Mavericks contest in California, plus the other two Northern Hemi events on the Big Wave World tour if funds permit. He’s been given a small opportunity to get in to the events, and we are all rooting for another Saffa champ, so come along and throw a few notes into the collection box for him at the bar. The following day the Kommetjie crew are hosting a Board Swop, picnic and concert (Sean Koch & Ryan Kidwell) on the Kom lawn, raising funds for Mike’s campaign. There are some amazing prizes being raffled off, lots of surf merch and even one of Twiggy’s boards!! Add this to the WP Ladies Longboard champs happening at Long Beach, and opening of crayfish season, its gonna get festive!! 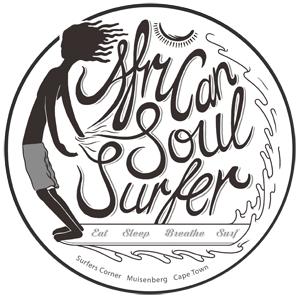 African Soul Surfer is offering accommodation deals for anyone wanting to come down to these events from Town-side. Dorms are R150/night and Private rooms with sea-views are from R300. I would like to come with my wife Cath to your event on the 14th. Looking forward to it. OK if I bring a couple of friends? Mr Andy Mason you are most welcome!! © 2019 African Soul Surfer - Muizenberg, Cape Town. All Rights Reserved.